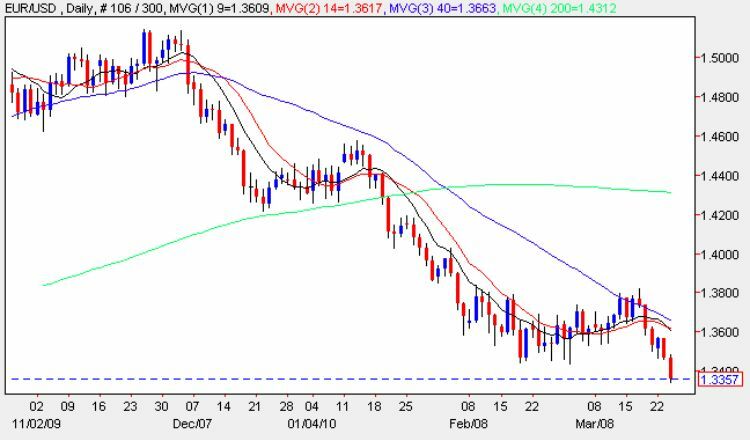 Yesterday’s narrow spread down candle on the daily euro vs dollar chart, continued to reinforce the bearish sentiment for the euro vs dollar pair with the low of the trading session testing the base of support at USD1.3450 and closing once again below all of our four moving averages. As outlined in yesterday’s market commentary any break below USD1.34 would be significant and this has already occurred in the London trading session this morning, no doubt helped lower by further worries about Greek sovereign debt. Ironically this is in stark contrast to all the fundamental news for the Euro this morning which was all positive but clearly the markets mood is being influenced by the former rather than the latter. With the deep price congestion now above it is unlikely that any rally from the current low will have any momentum and will simply be a short squeeze higher in an otherwise longer term downtrend. Should we hold below USD1.34 today then in the medium term we can expect to see a re-test of USD1.30 with USD1.25 a realistic target for the longer term. As outlined above the raft of European fundamental news this morning was, on balance, very positive with only the French PMI data, Industrial New Orders, and the Italian unemployment rate failing to meet expectation. The most important number was the German Ifo, a highly regarded index of business sentiment, which came out dramatically better than expected at 98.1 against a forecast of 95.8 which in turn had only seen a minor improvement over the previous month’s 95.2. Despite this good news the eurodollar lurched lower with the Greek tragedy once again taking precedence. This afternoon in the US we have New Home Sales which are forecast at 318k, slightly up on last month’s 309k which if exceeded should add further pressure to the euro.